A VPN is a useful service for anyone trying to avoid being targeted by cyber criminals, but is a must for people who tend to use unsecure networks, like those in coffee shops or airports, to perform professional level or sensitive tasks. VPNs are also used by journalists and activists to protect their identities. The standard use of a VPN is to protect your data, masking your IP, so that crackers are unable to access your information. The service a VPN provides is an encrypted tunnel to a remote server. Because your internet traffic takes place after the encryption, no one is able to track back to you as a source. At the same time, your IP address becomes that of the server so your location is not searchable. Another popular use of a VPN is to view shows on streaming services like Netflix that are not available in a specific region. US consumers use it to watch UK programming and some people from smaller countries (which have much less in the way of Netflix content) can use a VPN to access the glorious bounty of US content. 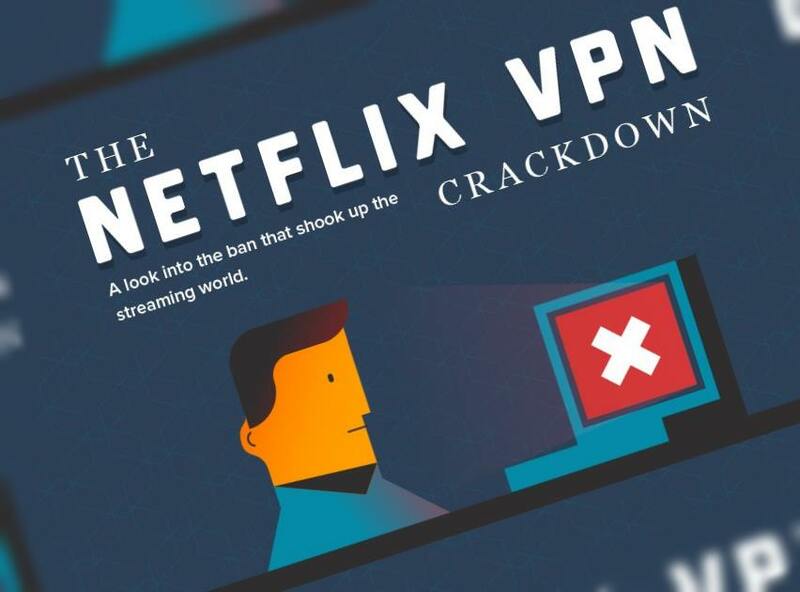 The infographic from TheBestVPN has more information about this. Basically, while Netflix claims they are working on the problem of global distribution, for now they have tried to crack down on the practice of fooling their system in order to access non-region content. Their reasoning is that they currently pay licensing costs per region -- therefore their international service cannot be accessed equally. Content owners are likely the impetus for this however, as they are not getting paid properly if people are accessing the content out of region. The argument from VPN consumers is that there is no specific reason NOT to offer a global package. If the problem is the added cost of licensing, then a tiered payment plan would be something that seems reasonable. But as of today, Netflix does not offer this. In the meantime, if you are in the US and want to catch up on BBC’s Orphan Black, or if you live in Taiwan where only around 550 titles are available in region, you will need a VPN to spoof your address in order to access the over 6200 titles that, for example, Japan provides. Netflix uses a number of VPN detecting protocols to block users attempting to access them via a proxy server. For example, a detector can identify the shared IP address of the VPN server and deny access. Because a VPN server may share with possibly hundreds of users, it is relatively easy for the detector to identify a VPN due to the massive amount of data being accessed. A workaround for VPNs is to purchase and use a larger range of IP addresses, but if Netflix discovers a specific IP address is being used by a VPN, it may block a number of related IP addresses. Then, even if you want to access Netflix in your home region, you will have to turn off your VPN to do so. Also, when using the Netflix App, it may lead to your device divulging your default ISP server name. Your VPN will use a different server and this discrepancy is something that Netflix closely tracks. It leads to an error message when trying to stream. They can also do more simple restrictions like only allowing users to access content from the country of their billing address. There are a number of workarounds that VPNs or VPN users use to defeat the Netflix blocking protocol. One is to install the the VPN software into a router rather than on devices and then to configure the router to forward any DNS queries to the servers that your VPN is using. When these matchup, Netflix would not identify any issue. A VPN provider should have instructions on how to accomplish this. Other methods performed by VPNs are likely proprietary and thus mysterious, but many of the most popular services still can boast the ability to connect to the global library of Netflix. PrivateVPN: Which is custom built to access Netflix - with servers in the US, UK and the Netherlands (and presumably others changing all the time). VPN.ht: Though they ostensibly primarily promote their ability to protect your data, this Hong-Kong provider mentions their ability to access Netflix on their homepage. GooseVPN: While they are a little more guarded about their ability to access Netflix, a brief search of their blog reveals posts on streaming service access. StrongVPN: Boasting over 650 global servers in 24 countries, this VPN service seems to easily access Netflix as part of their prodigious offerings. LiquidVPN: This VPN makes no bones about their policy toward Netflix blocking. They state as their first feature that they can unblock the streaming service to access other regions. These are by no means the only 5 services that are still testing as providing access to Netflix. While the technology continues to evolve on both sides, customer freedom and licensing protection will continue to hold skirmishes around the VPN arena.